TAILBOARD FIELD CAMERA. 1873-1875. This mahogany tailboard camera is very similar at first sight to the James Lancaster early pre-1887 Instantograph, but putting it side by side with an Instantograph detail differences are apparent. However, the similiarities are such as to raise suspicions of either collusion or plagiarism between Cox and Lancaster in the deisgn area. 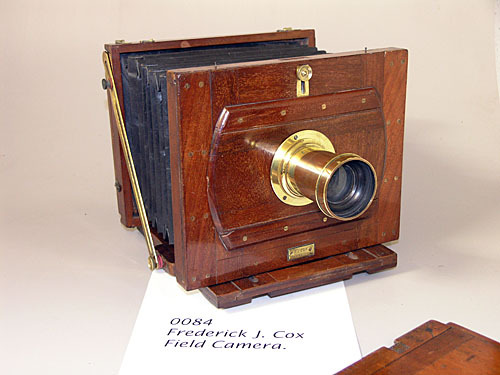 This Cox camera is another one that came to me in rather decrepit condition, and some restoration work was needed to bring it to its present fine condition. 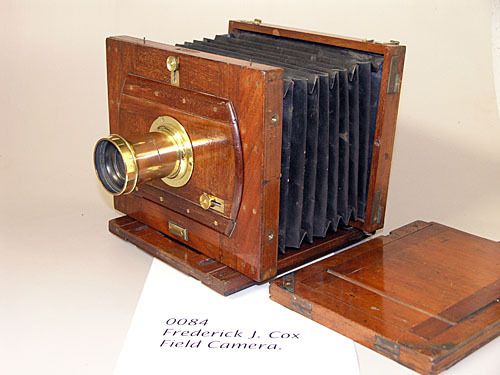 The camera is labelled "F.J. Cox, Eastbourne", though I have no record of an Eastbourne address for Cox. Starting in 1845 as an optician, he was listed as a photographic apparatus maker from 1858, and was known to be making cameras like this one in 1873, so my date of 1873-1875 is reasonable. He was at 26 Ludgate Hill, London, from 1867 to 1882, so some further research is needed to establish and Eastbourne connection.